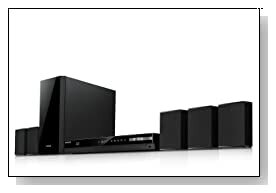 If you are looking for a good home theater system at decent price, Samsung HT-F4500 is one to consider. Our team reviewed this low cost 3D Blu-Ray home theater system and found its performance satisfactory. The model has reasonably good specification and features at an affordable price. Samsung is one good consumer electronics maker with reliable quality and durable product offerings. Particularly this system is built with reliable quality and well suitable for a budget home cinema system. Let’s have a detailed look on its performance and features. High quality surround sound audio output with powerful 500 watts. 3D Blu-Ray disc with SD to HD video upscale technology for best video output quality. This model supports all kinds of media file formats. It comes with all essential features at an affordable price. This model doesn’t have great features compared to other home theater systems we reviewed earlier, but it does extremely well in what it is designed for. The 5.1 channel system comes with total output power of 500 watts. It also supports Dolby Digital Plus, Dolby True HD and DTH HD features. Its audio output is decent for a medium sized leaving room. Bass and vocal clarity at different volume levels are found good, you can expect good audio experience at any volume level. Samsung HT-F4500 supports all kinds of discs including 3D Blu-ray, Blu-ray and DVD. All common media file formats are read by the system without any considerable lag. This model also has latest technology to upscale video quality, regular DVD movies are up-scaled to near HD quality. Watching high definition Blu-ray movies on this system was an amazing experience. Its video upscale technology with powerful audio brings life to home cinema experience. This model also has built-in FM tuner, Bluetooth, DLAN and online streaming media support. Overall the Samsung HT-F4500 has everything to fulfill basic home theater needs. This model is missing few features like WiFi connectivity and NFC supports etc. compared to high cost systems. 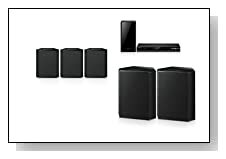 At a very affordable price, Samsung is offering all main features of high end home theater systems in this model. Also the performance and built-quality of this unit was exceeding our expectations. Considering its specifications and price, we recommend this model is the best choice for a decent home entertainment system.